PS: Will Send Pix ASAP !! Merry Christmas ! I hope that you aren’t too busy to take time for yourself and enjoy the holidays. I’ve moved to Traverse City, Michigan and so far I really love it. My nose is looking great. I’ll get some pictures taken at 3 1/2 months to send you. I cant thank you enough. My self confidence is through the roof and it’s really been a life altering experience for me. 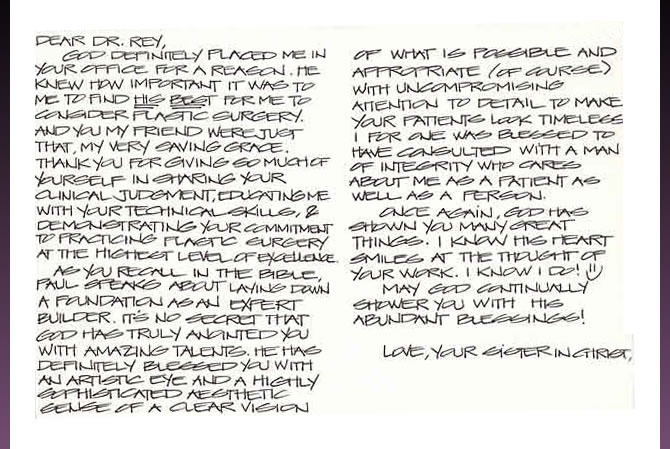 Thank you for sharing your past experiences with me, they’ve made you a very compassionate + dedicated surgeon + person. I’m glad we became friends. I wanted to get a chance to say thank you. You did a wonderful job and really spent the time to make me feel so comfortable. also thank you so much for making time in your busy schedule and making everything work so perfect! You must make many people happy. This was something I have wanted to do, but was very scared as well. I am glad I listened to your advise and you made me so trusting in you. Thank you again, your a wonderful man & doctor. I will be in the area in a week or two and will see you then. hope I can be in your book of perfect “D”s! I just want to thank you for taking such good care of me before and during surgery. Everyone was so nice and made me feel comfortable. Norma and Susan are both so pretty and sweet and very helpful. And I just love my body now, I can hardly believe it’s me looking back at myself in the mirror. I’m just so happy with the results and I wanted you to know your the best! May the Baby Jesus be a tender reminder of God’s love and continue to grow as the ruler of your heart at Christmas and always. I just wanted to wish you all a wonderful holiday season! I’m still very much enjoying new me. I just wanted to take a few minutes to express a sincere thank you during and especially during my recovery after my surgery. The end results are still a couple of weeks away but I am extremely happy with my new additions so far! 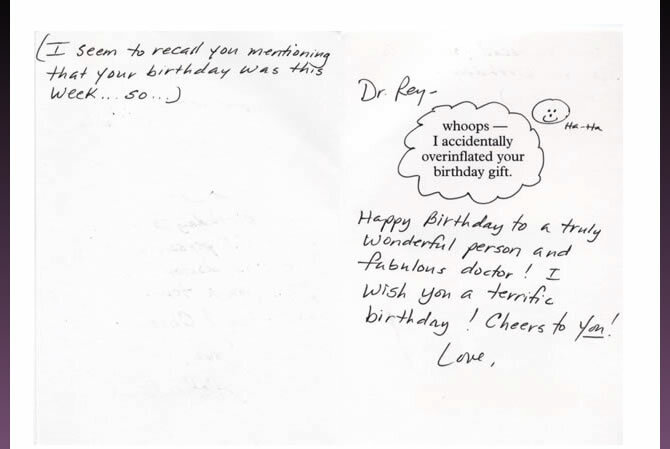 You are truly one of the nicest and warmest doctors I have ever met, not to mention truly one of the most talented! 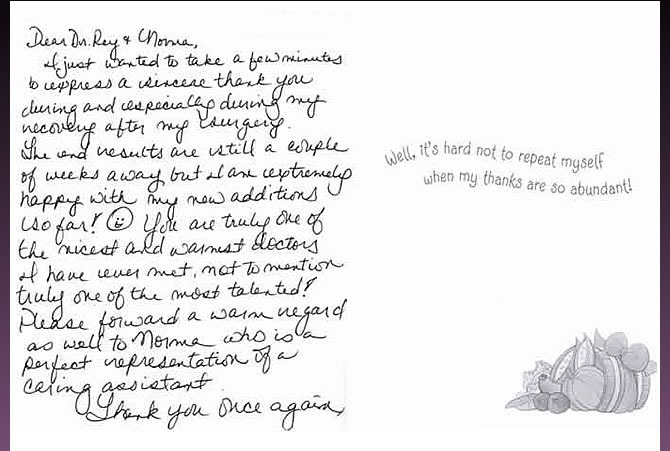 Please forward a warm regard as well to Norma, who is a perfect representation of a caring assistant. God definitely placed me in your office for a reason. 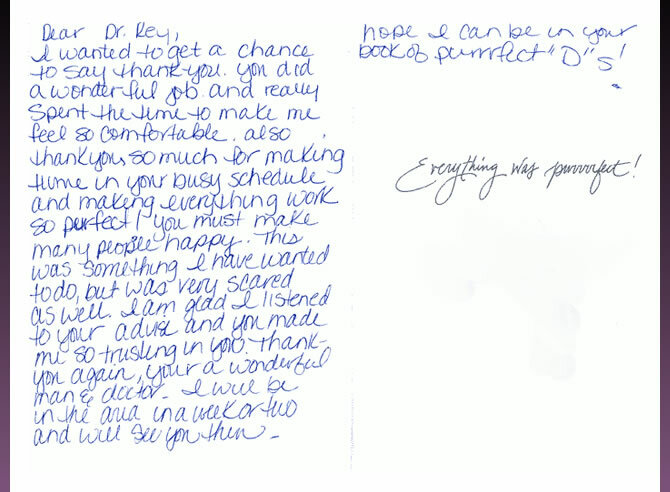 he knew how important it was to me to find his best for me to consider plastic surgery. And you my friend were just that, my very saving grace. 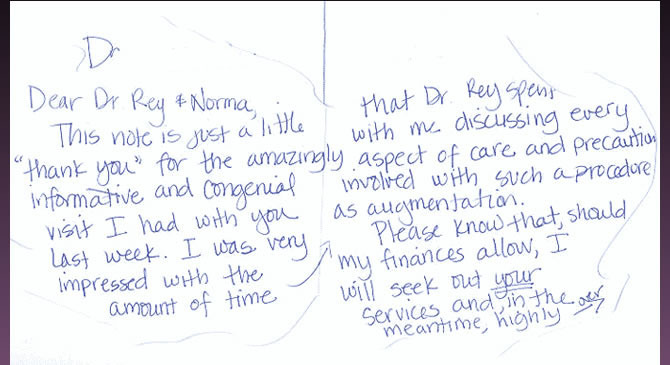 Thank you for giving so much of yourself in sharing your clinical judgment, educating me with your technical skills, and demonstrating your commitment to practicing plastic surgery at the highest level of excellence. As you recall in the bible, Paul speaks about laying down a foundation as an expert builder. It’s no secret that God has truly anointed you with amazing talents. He has definitely blessed you with an artistic eye and a highly sophisticated aesthetic sense of a clear vision of what is possible and appropriate (of course) with uncompromising attention to detail to make your patients look timeless! I for one was blessed to have consulted with a man of integrity who cares about me as a patient as well as a person. Once again, God had shown you many great things. I know his heart smiles at the thought of your work. I know I do! May God continually shower you with his abundant blessings! I just wanted to thank you for your time during my recent consultation. I appreciated your openness and your willingness to answer all of my questions. I also thank you for your opinions and suggestions. I look forward to planning the procedure soon. Again, thank you for your kindness and sincerity. With a million patients I don’t suspect you remember me but you might remember the girl with the strange looking designated driver Doug! How are you? I am absolutely happy with the way my breasts turned out!!! Now I’d like to come in and have the mini-tummy tuck done. I called and made an appointment, June 3rd is the earliest I could get. I just want to be ready for the summer especially now that my husband got us a second home in Manhattan Beach. 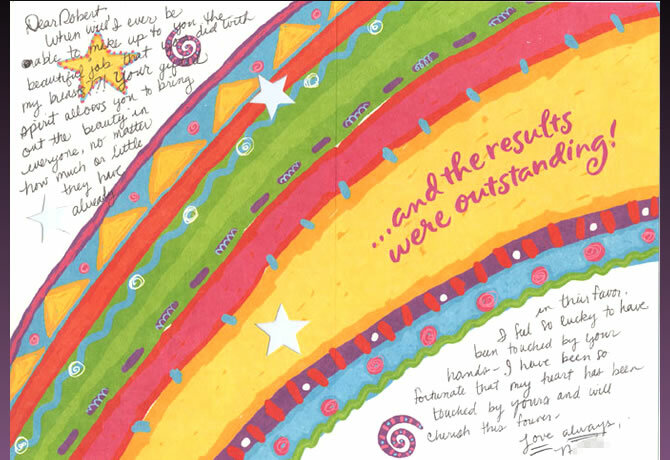 I look forward to meeting with you to discuss all this…and once again I think that you are truly phenomenal!! Thank you so much for doing such a wonderful job! I’m very happy with my results and couldn’t ask for more! 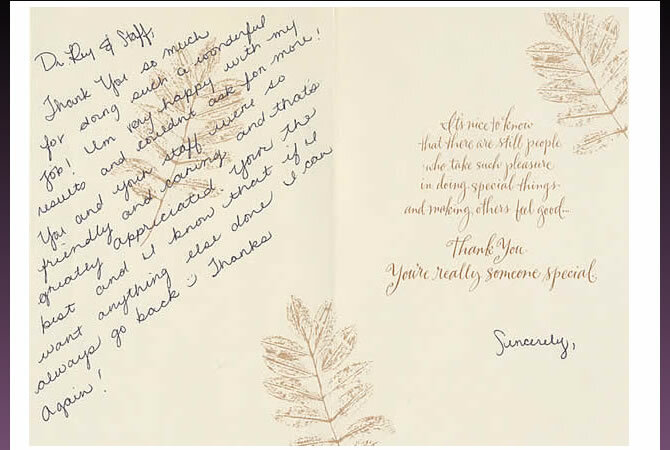 You and your staff were so friendly and caring and that’s greatly appreciated. You’re the best and I know that if I want anything else done I can always go back. Thanks Again! just a quick note to thank you for changing my life! I got my breasts done on the 9th of May and now all my family and friends want to go see you! I have to much more confidence and I’m sure when my husband returns from war he will want to thank you as well. He’s dying for me to send him pictures but I wouldn’t want them to get into the wrong soldier’s hands! I’m planning on later getting some other procedures done cause I just had the best experience with this surgery so I ain’t afraid of doing other things. 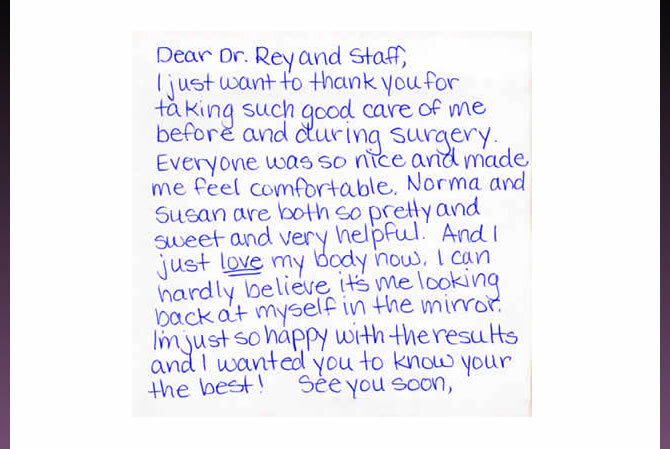 You make your patients feel at ease and I just love that about you! Once again thank you so much and when I return from Germany you better believe I’ll be paying you a visit. I wanted to ask you to place my before and after pictures cause you performed a miracle on me!! I thought noone could make me look better but you surely did. Anyway keep up the wonderful work you deserve all the success in the world. Thank you so much for all of your support, everyone was so warm and patient with me, both in-person and on the phone. I am thrilled with the results and feel better and better everyday. 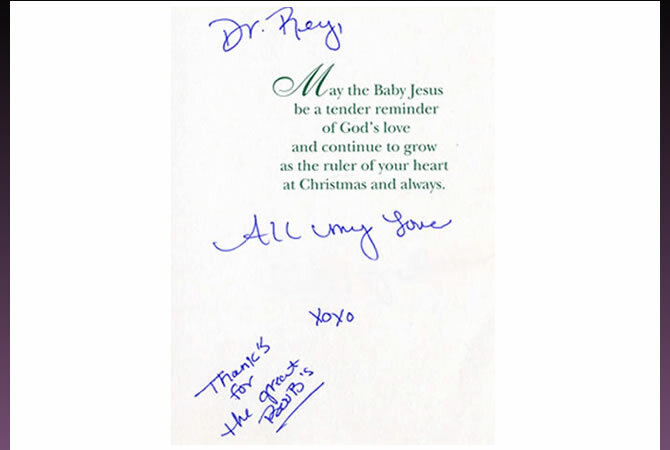 Dr. Rey, you are the best and I am so happy to have had worked with you. I will make an appointment to see you next time I am in L.A. Thank you again for everything, you guys are wonderful. I wanted to thank you (A. too!) 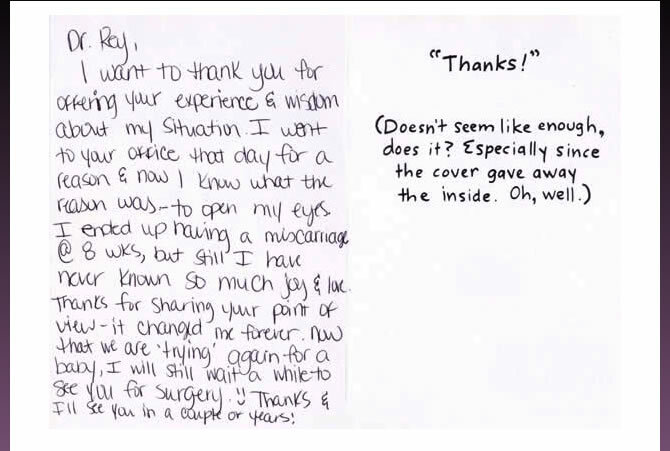 for an absolutely fabulous job on our breast augmentation, nothing but praises. Compliments and hats off to you for a wonderful job. Both A. and I never felt so good, your the greatest! See ya on the 16th! I want to thank you for offering your experience and wisdom about my situation. I went to your office that day for a reason and now I know what the reason was – to open my eyes. I ended up having a miscarriage at 8 weeks, but still I have never known so much joy and love. Thanks for sharin your point of view – it changed me forever. Now tha we are ‘trying’ again for a baby, I will still wait a while to see you for surgery. Thanks and I’ll see you in a couple of years! I just wanted to take a second to thank you from the bottom of my heart! I know that God lead me to you! You are a wonderful Dr. and did an excellent job! I feel so great about myself, and can finally walk with my head held high! You are all the best! I will miss you all so much! May God bless you and your practice!